Charles (Omar) McBride caps off his breakout indoor season with a new North Carolina Indoor State Record at New Balance Indoor Nationals! 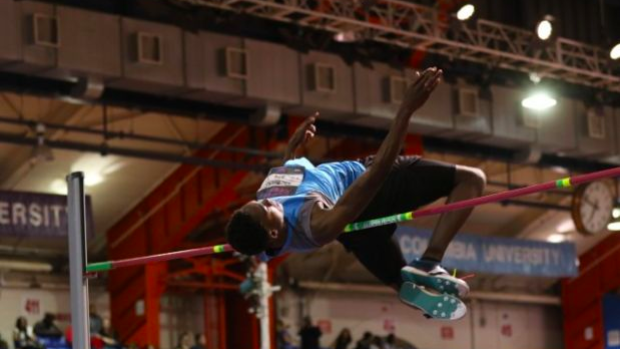 McBride took 3rd overall as he became the third North Carolina athlete to clear 7 feet indoors. He finished at 7-0.25 in a tie for 2nd overall, but was third due to misses as he cleared 7-0.25 on his third attempt. McBride wasn't the only All-American from North Carolina in the field. Randolph Ross took 4th overall clearing 6-10.75, but missing at 7-0.25. Ross' mark will move him up to NC#4 All-Time Indoors. Prior to McBride's performance John Deberry (Richmond County, 1990) and Jesse Williams (Broughton, 2002) were the only athletes from NC to ever clear 7 feet indoors. Both capped at 7-0 and have been tied for the Indoor State Record for 16 years. McBride and Ross will be the top 2 returners next season, and it's safe to say both will challenge the Outdoor State Record of 7-3.25 over the next two years.